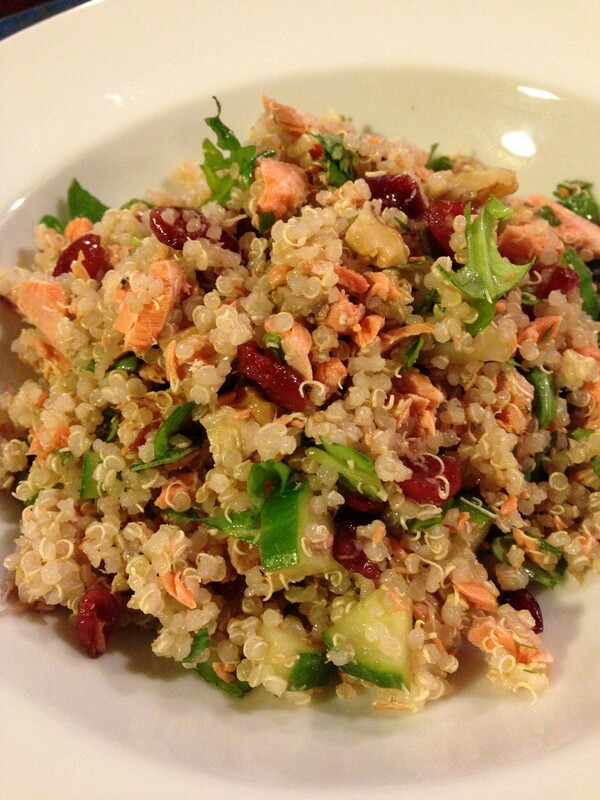 Healthy Quinoa Salad with Salmon, Cucumber, Cranberries, and Walnuts. On those hot summer evenings when no one really wants to cook, my Healthy Quinoa Salad with Salmon, Cucumber, Cranberries, and Walnuts is an easy option. When it’s too hot to do anything substantial in the kitchen, this is a tasty chilled salad that you can start in the morning when the house is still cool. 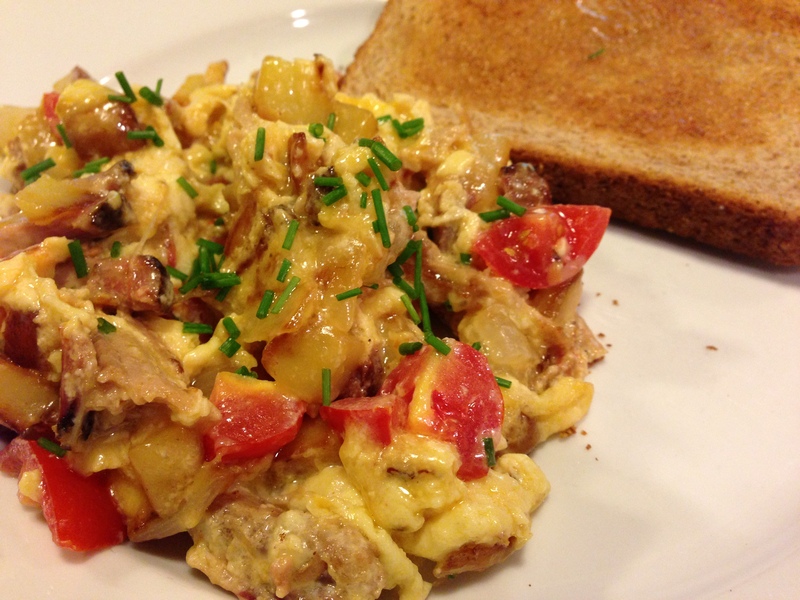 And, if you have leftover cooked salmon from another meal, you can use it in this dish. You’ll need to bake the salmon and cook the quinoa either early in the day, or even the night before, so they can chill properly. Bake the salmon with some butter, salt and pepper. Cook the quinoa. 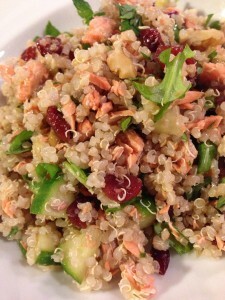 Cool both the salmon and quinoa in the refrigerator for a few hours or overnight. 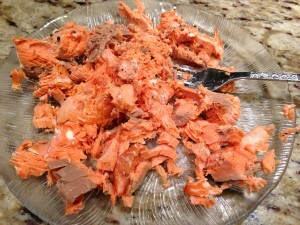 When the salmon has chilled, flake it with a fork. Combine with the chilled quinoa in a bowl. Cut the cucumber into rounds then triangles and add to the bowl. 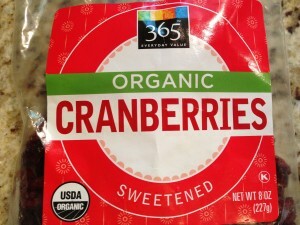 Add the dried sweetened cranberries. Chop the arugula, cilantro and walnuts and add to the bowl. Add the pomegranate vinegar and olive oil and mix everything together. 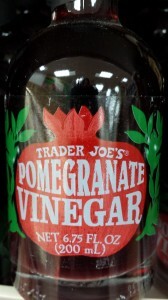 I use Trader Joe’s pomegranate vinegar but you can use apple cider vinegar mixed with some honey or agave syrup. Pompeian Vinegars also has a pomegranate vinegar that you may find in your grocery store. 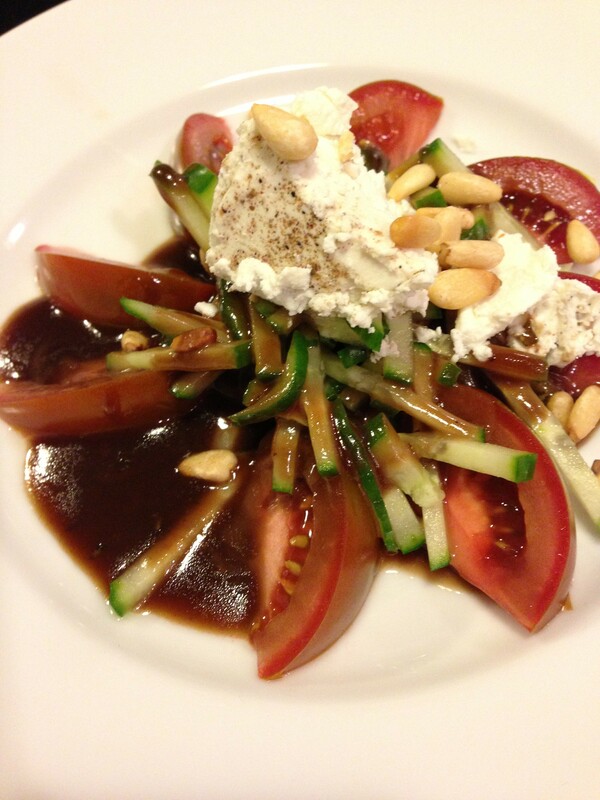 See the end of this recipe to purchase some Pompeian Pomegranate Vinegar online. Chill for 4 hours or overnight, stirring occasionally. When chilled, serve the salad! You can add some goat cheese crumbles if you wish. An orange flavoring goes well with this salad, so you can substitute freshly squeezed orange juice and a little honey for the pomegranate vinegar. 1. Combine the quinoa and water in a 3 qt saucepan and bring to a boil. Lower the heat and cover, simmering until the quinoa absorbs the liquid and the little grains have “popped” — 15 – 20 minutes. Set aside to cool. Chill several hours or overnight. 2. Preheat oven to 400 degrees Fahrenheit. Line a baking pan with aluminum foil or parchment paper. If using foil, spray the foil with cooking spray. 3. Place the salmon on pan, skin side down. Dot with the butter and sprinkle with salt and pepper. 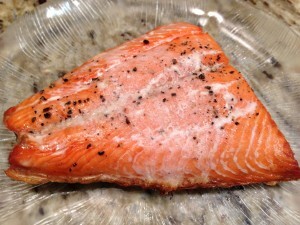 Bake the salmon for 14 – 18 minutes or until done to your liking. Remove from oven and set aside to cool. Chill several hours or overnight. 4. When the quinoa and salmon have chilled, take them out of the refrigerator. 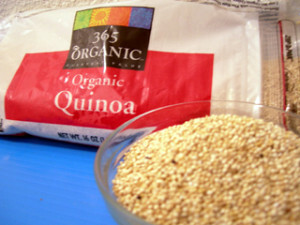 Fluff the quinoa with a fork and put it into a large non-metallic bowl. 5. Remove the salmon from its skin. 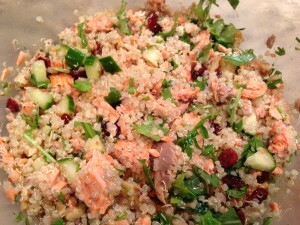 With a fork, flake the baked salmon flesh into chunks and add to the quinoa in the bowl. 6. 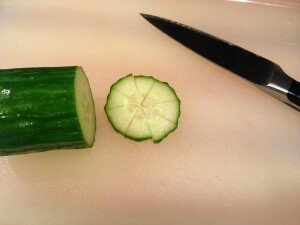 Slice the unpeeled cucumber into 1/8 inch rounds and then cut “diagonally” into 8 little “triangles” each. Or you can dice the cucumber into 1/4 inch cubes if you prefer. 7. Add the sweetened dried cranberries to the bowl. 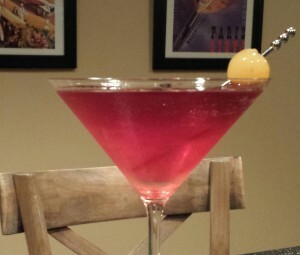 I usually soak the dried cranberries in water for about 15 minutes first for a softer texture. 8. Chop the walnuts, arugula and cilantro and add to the bowl. 9. Drizzle the olive oil and vinegar over the salad and mix to combine. 10. Chill the salad in the refrigerator for another 4 hours or overnight, stirring occasionally. Adjust seasonings prior to serving. Serves 4 as a main course, or 8 as a salad course. Sprinkle with goat cheese crumbles if you wish. Variations: Use grilled or poached cooked chicken or turkey breast instead of the salmon. 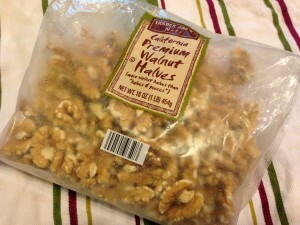 Substitute chopped pecans or whole pine nuts for the walnuts. 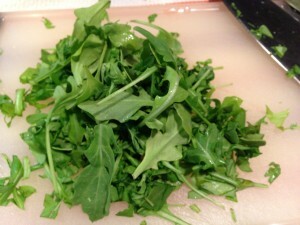 Use fresh spinach instead of arugula. Use parsley instead of cilantro. If you can’t find pomegranate vinegar, use apple cider vinegar with 1/2 T honey. You could also use freshly squeezed orange juice instead of the vinegar. 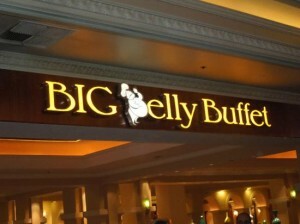 Omit the salmon for a vegetarian option.